A brief history of mankind: In the beginning, there was wood. Then, the heavens bestowed upon us the wood-fired oven; brick ovens have been discovered in excavations of nearly every ancient civilization. Finally, pizza was created, and it was good. Modern wood-fired pizza ovens are usually dome-shaped, insulated with high-tech ceramics and refractory materials for efficiency. No electricity or other power source is involved; the ovens are heated with wood, as in the days of Pompeii, where nearly intact brick ovens have been found preserved beneath the ashes of Mount Vesuvius. "Fire-in-the-oven" cooking—650 degrees and up—is used for cooking pizzas, flatbreads and such, but pizza ovens are also used for roasting meats, fish and poultry, baking breads and desserts, cooking pasta dishes and more. In capable hands, the wood-fired pizza oven is an amazing culinary tool. I could be wrong, but I'm pretty sure the first wood-fired pizzas to appear in Utah arrived with the opening of Red Rock Brewery. It's the first I remember, anyway. Years later, Settebello upped the ante with its genuine Vera Napoletana wood-fired pizzas, followed by many more like From Scratch—one of my favorites. I recently had the distinct and delicious pleasure of discovering two more wood-fired pizza restaurants, both of which are as worthy a visit as any in our state. Last year, executive chef/partner David Kimball opened Oak Wood Fire Kitchen in Draper. Why did it take me until now to check it out? Well, it's in Draper. But now, Oak Wood Fire Kitchen is permanently loaded into my car's GPS system, as I'll be visiting Draper for pizza frequently. This restaurant is not just about pizza, however. The pizza is incredible, but so were the other dishes we tried, beginning with a gargantuan serving of fried calamari ($9) with lemon and parsley on a smear of zippy "feisty sauce." Other worthy starters include Oak Bread ($4) with parmesan, rosemary, garlic oil and black pepper, and incendiary Sriracha-honey chicken wings with shredded carrot slaw and blue cheese ($10). If the planets align correctly, you'll have the luck to be served by an über-friendly and outgoing fellow named Ryan. He could make even a mediocre meal enjoyable, so imagine how much fun you'll have with Oak Wood's excellent cuisine. I'm a sucker for spaghetti and meatballs ($12), and when Ryan told us that the meatballs and sauce—like most menu items—are made from scratch, I was in. I was pleasantly surprised when the dish arrived. The al dente thin spaghetti was lightly coated in homemade tomato-basil sauce, not smothered to death with it. Atop the mound of spaghetti rode three handball-size meatballs, house-made with a perfect combination of pork and beef. These meatballs vie with Vinto's for the best balls on the Wasatch Front. By the way, they're also available as meatball sliders ($12), on Stoneground brioche buns with fresh mozzarella, basil and tomato sauce. My wife opted for a Caesar salad (called Cassar salad as tribute to regular customer and Real Salt Lake Coach Jeff Cassar) with seared salmon. It was an entire salmon filet, perfectly cooked, and equally perfectly dressed romaine lettuce. It's a salad that would make Caesar himself proud. Ultimately, though, it's the wood-fired pizzas that will bring you back again and again. As always, my baseline for pizza is the Margherita, so I ordered one. Wow. It's not rocket science to make a good Margherita pizza—I do it at home all the time—yet so many places screw it up. Not Oak Wood Fire Kitchen, however. It is as good—and as simple—as the best Margherita I've ever tasted. Nothing more than top-notch crust, lightly charred bubbles intact, with tomato sauce, fresh mozzarella cheese and fresh basil ($10). Next time, I'll try the Creminelli prosciutto and arugula pizza with fontina, Parmesan and ricotta. Passing through Logan on the way to Bear Lake, we stopped in to Jack's Wood Fired Oven, a place I've heard raves about for years. Shame on me for not heading to Jack's sooner. Those raves are justified. Originally opened and owned by Jack and Julie Carlisle, more recently Jack's has been in the hands of a super-nice guy named Steve Sampson. Even more recently, Marc Ensign became the new owner, and his son Jordan is the new manager at Jack's. Stop by at lunchtime, as we did—or apparently anytime, from what I'm told—and there may be a wait for a table. The place is consistently packed and popular. And, with $8-$9 lunch specials that include a personal pizza and a generous salad or soup of the day, why wouldn't Jack's be mobbed? A homemade Tuscan potato soup with sausage morsels was one of the best soups I've enjoyed in many a moon. And definitely order the addictive Lyon bread ($4) to nibble on while you wait. It's crisp pizza crust with melted cheese—nothing more, nothing less, and it's sensational. The Margherita pizza at Jack's—again, my baseline pizza—was absolute perfection. But, there are other tremendous wood-fired pizzas that demand attention, too. 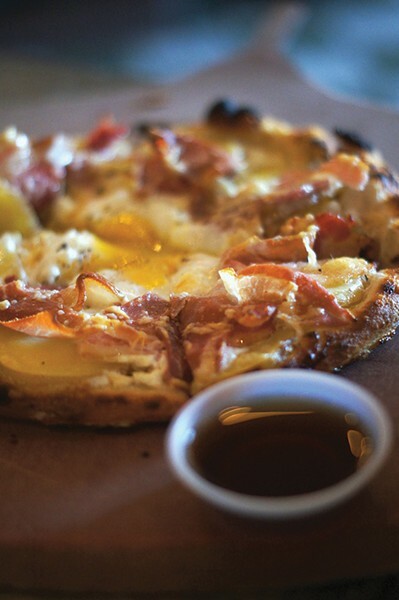 My favorite is The Sunnyside ($15.50), which is a breakfast lover's pizza dream: potatoes, cream sauce, prosciutto, bacon, smoked cheddar and—the best part—two sunny-side-up eggs, finished with maple syrup. My wife and I both enjoyed her Cozumel ($15.50) pizza with white sauce, small shrimp, avocado, Peppadew peppers and Caribbean spices. If that's not enough to entice you to travel north or south, both of these excellent wood-fired oven eateries also offer respectable selections of beer, wine and, in the case of Oak Wood, cocktails. Go get fired up!